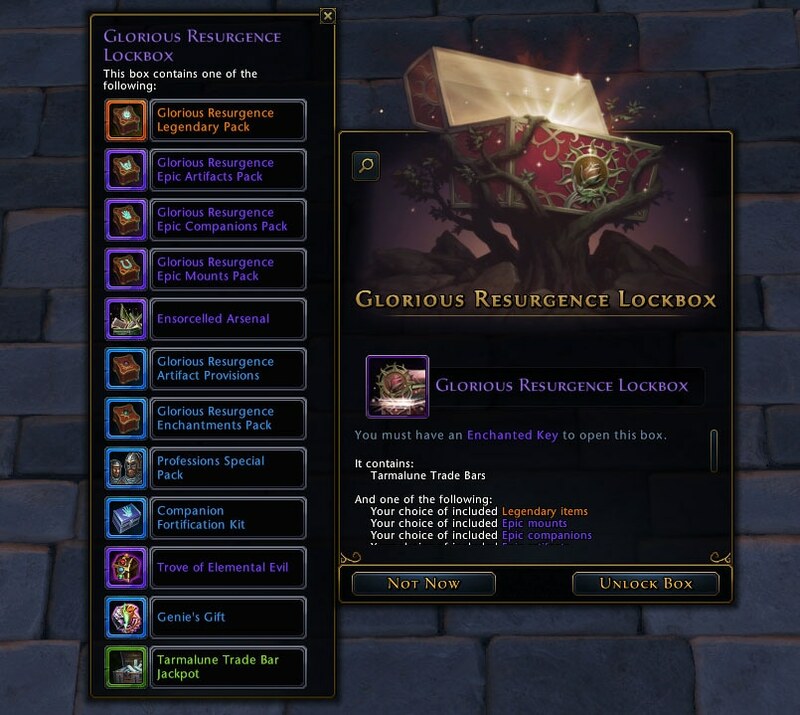 Update 8/11: The Glorious Resurgence Lockbox will return until Storm King's Thunder goes live on August 16! The Glorious Resurgence Lockbox is nearly upon us, it’s the perfect time to take a look at exactly what you’ll have the chance to find when these hit live with Underdark. First of all, for those who aren’t familiar with the concept, a lockbox resurgence is when old lockboxes that are no longer available reappear, bringing with them all of the top-end rewards (mounts, companions and artifacts) they originally contained. In an effort to make things simpler and less demanding on your inventory, we’ve set up a new type of lockbox resurgence: a single lockbox called the “Glorious Resurgence Lockbox” will drop in the world and be available in the wondrous bazaar. The resurgence lockbox will contain all of the common lockbox items relevant to the current game: familiar items like professions special packs, genie’s gifts, trade bar jackpots and the trove of elemental evil. But when it comes to epic and legendary items like mounts, companions and artifacts, should you win yourself one, you’ll receive a corresponding “glorious resurgence pack” from which you will be able to choose your own reward. We wanted it to feel like you’d gotten lucky opening the box of your choice, without having to clutter your inventory. Looking to get your hands on the ever-popular Tenser’s Floating Disk? Or perhaps you’ve been itching to start a new character as a Metallic Dragonborn? Well, if you get your hands on a Glorious Resurgence Legendary Pack, the choice is yours. Epic Artifact, Companion and Mount packs will also be available. From them you’ll be able to choose any of the epic mounts, companions or artifacts that were available from the very first lockbox: Nightmare, all the way up through the Dragonforged lockbox. As usual, lockbox prizes can be sold and traded, including the new resurgence packs. So get your keys ready for a chance at some epic treasure you may have missed out on!